Poor Xena could write the book on E-Collars. She has had 3 of them in her lifetime, and spent countless weeks and months living in them. Why? Only now can I explain that. For years, Xena had a constant flow of hot spots. They were nearly always in the same locations--the places that came in contact with the ground, when she layed in our grass. This always was curious to me; I knew there had to be a connection, but didn't know what that connection was. Finally, we have our answer. These pictures were take about 1-1/2 years ago when Xena had her last hot spot. Before this one, she had them almost back to back throughout her life. 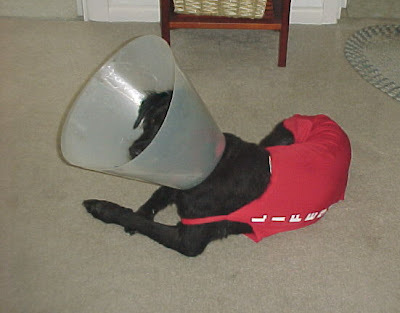 Our neighbors probably thought we were torturing her, as she constantly had to wear an e-collar, to keep her from chewing at the spots and infecting them. Oh, sure, we had cute names for the thing. Lampshade head. Megaphone girl. 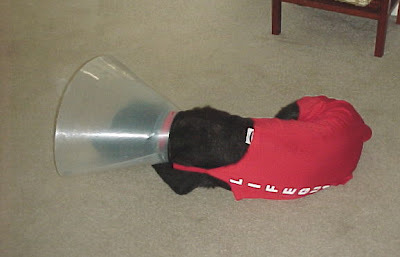 Conehead. You name it. But it didn't make her feel any better. Now, after 18 months since I stopped our chemical lawn care, it is clear to me that this was the cause of Xena's skin problems. I wish I could give all those months of itching and scratching and chewing back to her. At least now, with our new organic lawn care, there are not chemicals or pesticides on the lawn to irritate her skin. Since the change in lawn care, Xena has played freely in our yard without so much as a bug bite. She enjoys the outdoors immensely. Sitting in the grass during the Winter is her favorite way to relax. Sadly, that last hot spot was a really bad one. She got her skin so infected with her chewing, that we had to shave her in order to treat the infection. She began to shake from the chills, as she had always had such a thick coat to keep her warm. It was the shave job that prompted the Lifeguard outfit. We call it her Pamela Anderson imitation. It made a good Halloween costume. Now that we know what was causing her problems, we've been able to fix them. We've hired an organic lawn care company to service our yard and our home. We use natural flea control on Xena and her buddies, Tanner and Oliver. These include food grade Diatomaceous Earth powder, supplemented with Cedar Oil spray. Both can also be applied to their bedding and carpeted areas. I also use Neem Oil Shampoo and conditioner to help keep her skin healthy. At her age, a girl's got to do what a girl's got to do. Right?! !